The City of Riverside Parks, Recreation and Community Services Department (PRCSD) received three Awards of Excellence and a Service Award of Excellence from the California Park & Recreation Society for its Explore Riverside Activity Guide, Capture Riverside Parks Photo Contest, Project Bridge Youth Development and Riverside Live Steamers. PRCSD’s recognition in the categories of Print Publication, Marketing Campaign, Champion of the Community and Youth Development and were honored at the Annual Awards Recognition Banquet on Friday, March 16, 2018 at the California Parks & Recreation Society Conference & Expo in Long Beach. 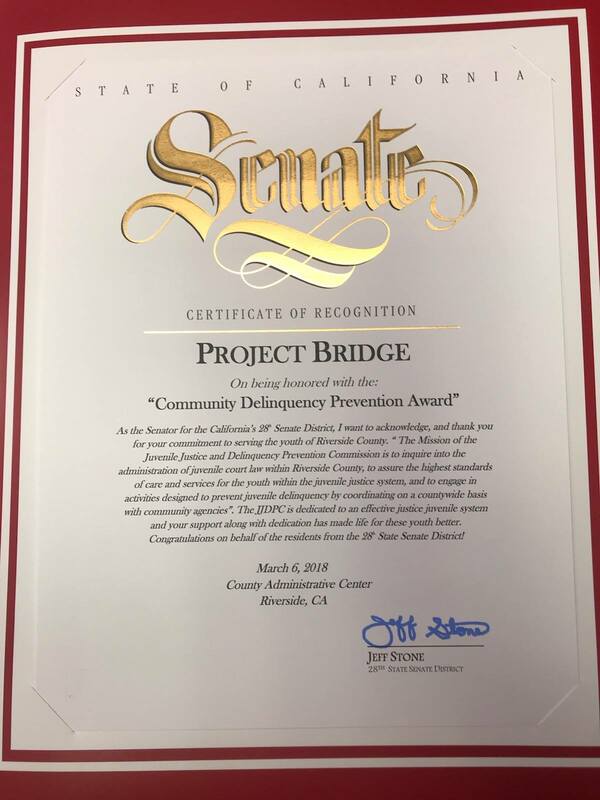 The City of Riverside Parks, Recreation and Community Services Department (PRCSD) received a Community Delinquency Prevention Award in recognition of the outstanding commitment, service and dedication to serving youth in the City of Riverside. Project B.R.I.D.G.E. 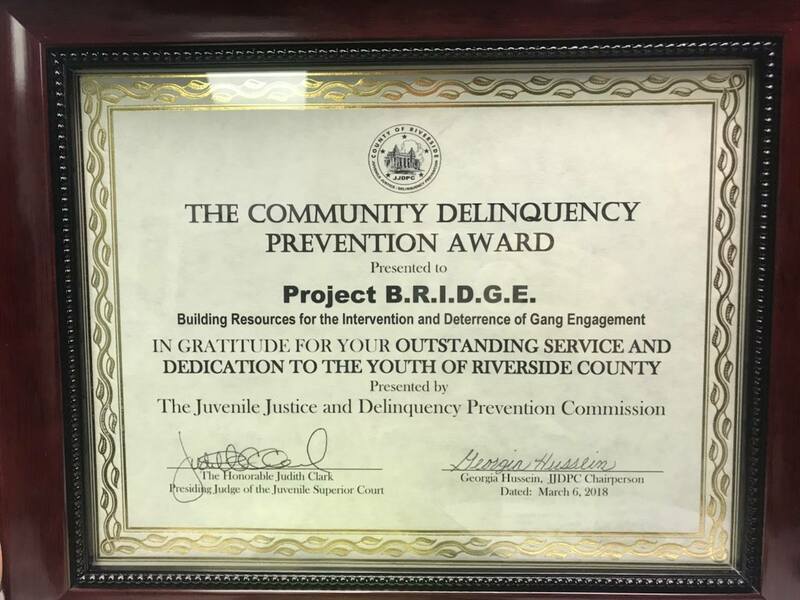 (Building Resources for the intervention and Deterrence of Gang Engagement) serves the community's gang-involved and at-risk youth and their families by providing social service programs, referrals, mentoring and recreational activities. Youth are referred to the program by schools, probation, parents and outreach workers. If you know someone who may benefit from Project B.R.I.D.G.E. services, please contact 951-826-2273. For more information on teen programs, please visit RivReg.org. Patti Solano, Community Services Superintendent in the City of Riverside Parks, Recreation and Community Services Department was recently selected to receive the Robert Wood Johnson Foundation (RWJF) Award for Health Equity. The RWJF Awards for Health Equity is supporting nine national membership organizations to find and honor individuals who are successfully using systems changes to advance health equity within their communities. NRPA is one of these national membership organizations. The RWJF-NPRA Award for Health Equity recognizes one person, or team of two, who has successfully implemented system-wide policies and strategies to reduce health disparities in his/her community through parks and recreation within the past two years. This award supports RWJF’s vision for a Culture of Health in which everyone has the opportunity to live the healthiest life possible. The RWJF-NPRA Award for Health Equity is one of 11 NRPA National Awards presented to individuals and agencies across the United States to honor their efforts in the field of parks and recreation. Recipients are selected from a pool of applicants by NRPA’s National Awards and Scholarship Committee and are chosen for excellence in a variety of topics, including professional and voluntary service, programming, leadership, research and public outreach. With over 15 years of service for the City of Riverside’s Parks, Recreation, and Community Services division, Ms. Solano was selected for her ability to build partnerships, execute city-wide initiatives, and make positive system-wide changes focused on Riverside residents’ health and well-being. Specific accomplishments include the creation of the Children’s Health Education Enrichment Resource (CHEER) building on the Bobby Bonds Park campus, adopting City-wide Healthier Food and Beverage Guidelines, the implementation of a “Walk with Ease” program at La Sierra Senior Center, overseeing Healthy Eating Active Living (HEAL Zone) programs, and, administering Nutrition Education and Obesity Prevention Branch (NEOPB) events. Riverside Deemed Playful City for the 10th year in a Row! KaBoom! and The Humana Foundation recognized the City of Riverside as a 2017 Playful City USA community for the 10th consecutive year. Riverside was among 300 cities identified nationwide that utilize play as an innovative solution to address a number of challenges facing kids, families and communities. Make play a priority, experience the benefits Riverside parks offer. The City of Riverside Parks, Recreation and Community Services Department (PRCSD) received an Award of Excellence and Service Award of Excellence from the California Park & Recreation Society for its Riverside Arts Academy program. PRCSD’s recognition in the category of Champion of the Community and Arts and Cultural Services were honored at the Annual Awards Recognition Banquet on Friday, March 3, 2017 at the California Parks & Recreation Society Conference & Expo in Sacramento. The Riverside Arts Academy is “Changing Lives!” The mission of the Riverside Arts Academy is to provide instruction in a broad-based curriculum that focuses on improving the quality of life through dance, music and visual arts for all youth. The programs teach discipline, improve self-esteem, inspire creativity, and help youth set and reach their goals. At the Riverside Arts Academy, participants are encouraged to explore, create, and reach their full potential. Now as an affiliate of the nationally recognized Harmony Project, the Riverside Arts Academy students take on challenges, build confidence, and collaborate on creative projects. Through their engagement with music, children become self-motivated lifelong learners, prepared to excel in school and beyond. The success of the Riverside Arts Academy would not have been possible without Riverside real-estate agent, Collette Lee, who became aware of the Riverside Arts Academy, its financial difficulties, and decided to put forth all of her efforts to ensure this program would be available to the community of Riverside for years to come. She is a true champion of the community. CPRS is a membership organization with 3400 members representing the 535 local parks and recreation agencies throughout the state. The mission of CPRS is to advance the profession and its members through education, networking, resources, and advocacy. Riverside deemed Playful City of the Month in August 2016! Riverside is a long time Playful City that has used extensive health initiatives to make their community more vibrant. They have collaborated with multiple partners to ensure that play proximity is more than just a concept. Fit for You Boot Camp - This free 12 week program consists of 2 components, one to teach children and adults a variety of exercises and the second features interactive nutrition education classes. Riverside is currently spreading the program into underserved communities to increase the impact. Start R.I.G.H.T. 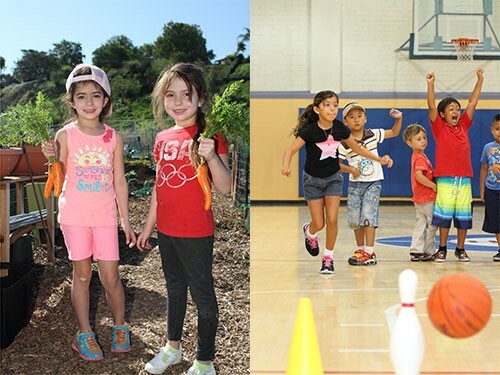 Campaign - A fit, fresh, and fun forum developed with the collaboration of non-profit agencies to help expand park athletics and fitness programming for all age groups. Residents are invited to bike with their local bicycle club or power walk with professional race walkers. PRCSD performs the Running Man Challenge to highlight how Parks Make Life Better! The PRCSD and community members performed the Running Man Challenge to showcase how parks are essential to quality of life and how Parks Make Life Better. Riverside deemed a Playful City USA for the 9th year in a row! The City of Riverside is proud to be designated as a Playful City USA for the ninth consecutive year! Playful City USA is a national recognition program sponsored by Humana Foundation in partnership with KaBOOM! honoring cities, towns and communities across the United States taking bold steps to ensure all children have easy access to balanced and active play in their communities. The Playful City USA designation gives the City of Riverside a competitive advantage, because it allows the City to showcase playability within 56 city-wide parks, 34 playgrounds, 12 community centers, and seven city-wide pools, which attracts new residents and businesses, and retains existing residents. The City of Riverside Parks, Recreation and Community Services Department (PRCSD) received multiple Awards of Excellence from the California Park & Recreation Society for its Public Reports and Villegas Park Design. 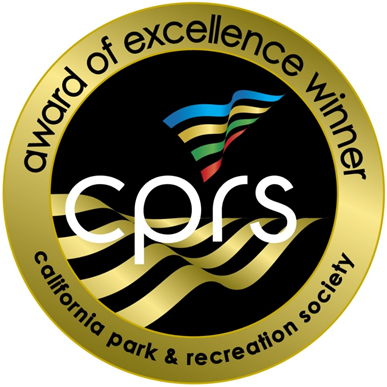 City of Riverside PRCSD’s recognition in the category of Marketing and Communication and Facility Park Design was honored at the 68th Annual California Parks & Recreation Society Conference & Expo, held in Long Beach, CA, March 8 - 11, 2016. Villegas Park was renovated with the goal of providing additional resources, programs and providing a sense of community. The renovations, inspired by the Community, have improved the lives of senior participants now getting involved in social and recreational programming. Youth participants in the after-school program and sports teams as well as adult enrollment in the ongoing fitness programs. By revitalizing our public reporting methods, PRCSD has gone from lengthy narrative reports with excessive data that was difficult to understand to achieving the objective of improving communication to the Commission and Council, engaging the public on PRCSD affairs at appropriate intervals, providing efficient use of staff time, as well as improving the look and function of the reports.